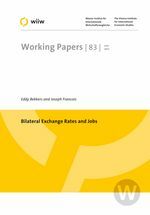 We study the labour market effects of bilateral exchange rate realignment. We place emphasis on the composition of trade, the role of intermediates, and the underlying conditions of the labour market. Employment effects hinge on the fraction exported to and imported from the trading partner. A larger fraction exported to and a smaller fraction imported from the trading partner make it more likely that appreciation has beneficial effects. Furthermore, more sticky price expectations in wage formation, a smaller fraction of intermediates in the production process, and a lower rate of importer pass through make it more likely that appreciation of the exchange rate of the trade partner has positive employment effects. At a more technical level, the scope for substitution away from higher priced inputs, either towards other sources of supply, or towards value-added, is also important to the direction and magnitude of changes in employment.